Russians have poisoned Hillary Clinton. Elvis Presley is alive and well. The Malaysia Airlines plane that disappeared in the Indian Ocean is the same one shot down over the Ukraine. These are just a few of the many, many conspiracy theories that flourish in the echo chamber of the internet. Mick West is a science writer and is dedicated to the art of debunking wild theories that circulate online and helping other people do the same, with his website, Metabunk. Saudi Arabian government has threatened to sell of hundreds of billions of dollars’ worth of American assets should the US Congress pass a bill that could hold the kingdom responsible for any role in the September 11, 2001 attacks, The New York Times reported. In another, he sits beside his wife after they were both frog-marched by Secret Service agents to a secure basement in the White House. And in a later shot, he takes his glasses off and clasps his hands together before he and his spouse are flown to an undisclosed location. These never-before-seen images capture Cheney’s reaction to the attacks, which saw two hijacked passenger planes crash into the World Trade Center in New York, another jet strike the Pentagon and a fourth crash in Pennsylvania on September 11, 2001, killing 2,996 people. 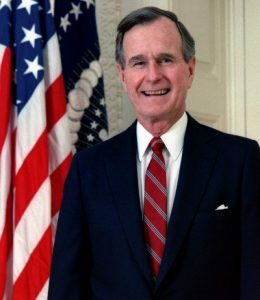 They also show the horror felt by other senior government officials, including then-President George Bush and his wife Laura, National Security Adviser Condoleezza Rice, CIA Director George Tenet, Cheney’s top lawyer, David Addington, and Chief of Staff Andrew Card. In the photos, Bush looks tense and even bites his lip as he confers with officials in the President’s Emergency Operations Center (PEOC), a highly-secure underground bunker below the White House’s East Wing that can withstand nuclear hits and other devastating attacks. The then-President would shortly address the nation about the day’s atrocities, which were aired live on TV screens across the world. The same evening, Cheney and his wife, Lynne, were flown via Marine Two to a secret destination, revealed in the photos to be Camp David.They were later moved to other undisclosed sites as thousands of rescue workers descended on the wreckage of the WTC towers. On the day of the attacks, Cheney, now 74, was in charge at the White House, with Bush visiting a school in Sarasota, Florida, at the time. Cheney has since defended the harsh interrogation techniques used by the CIA in the wake of the plane attacks, which included the waterboarding of 9/11 mastermind Khalid Sheikh Mohammed a total of 183 times, declaring that he ‘would do it again in a minute’. 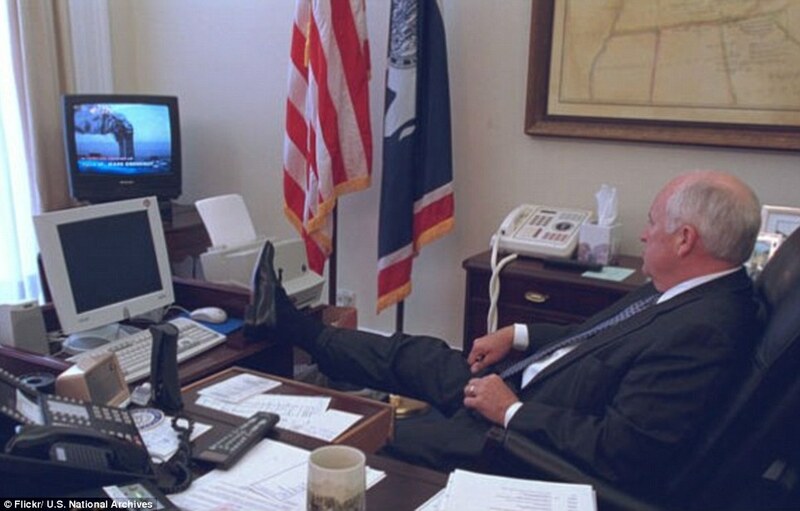 The newly-released images of Cheney and other officials’ reactions to 9/11 were captured by Cheny’s staff photographer, according to PBS. The photos were released by the National Archives following a FOIA request by FRONTLINE filmmaker Colette Neirouz Hanna. This stunning world news headline featured in the Taranaki Daily News Sat June 6th as a full page color image of the 911 insider attack underway in New York. Which about sums up what this asks of the reader . why were these papers not buried 12 years ago ? 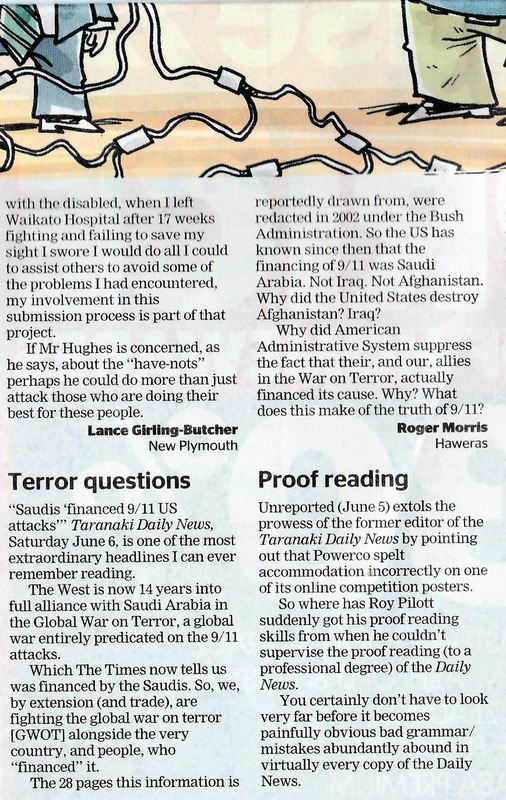 What does it mean, to ‘out’ your ALLIES in the ‘war-against-terror’, as being the very financiers’ OF it ? The attacks had until now been blamed squarely on the twice reincarnated ‘alQaeda’ Osama BinLaden, who, born of the House-of-Saudi, and a known asset of the CIA, had been dead for 13 years. A member of the original investigation into the attacks, Senator Bob Graham, Florida[retired,] is calling for a public release of the 28 redacted pages. why now ? the ‘Deepstate’ tells us it controls the media – so why NOW would it identify Saudi Arabia as the financiers of the 911 terror attack ? What does that do for the truth of 911,. If you are allies with the financiers of it.